Each Holiday Flat in Scotland reviewed on this page has been visited by the aboutaberdeen.com team and the reviews are based on our personal experience of a three day holiday. The first holiday flat in Scotland was at Dun House near Montrose and Brechin in the county of Angus in Scotland. It was booked through the National Trust for Scotland Holiday Accommodation brochure. We are now on the mailing list and get a free NTS Holiday Accommodation booklet each year which has photos and descriptions of the many National Trust for Scotland properties for rent throughout the year. These can be booked for a week at a time or for short weekend breaks. The aboutaberdeen team stayed from Friday to Monday and had a great time. Because we booked last minute we generously got the winter break discounted rates of �250 although we booked in summer. We were lucky to get a last minute deal and to avoid disappointment we do recommend booking as early as possible because these properties are much in demand which comes as no surprise because they are so well equipped and comfortable to stay in. 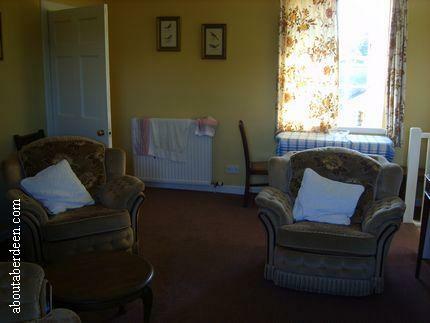 Dogs are permitted to stay at the Dun House flat at an additional cost of �15. There is plenty of areas around Dun House to walk the dog and please remember your poo bag. A vacuum cleaner can be found in the flat to clean up any dog hairs and a mop is there for any accidents on lino floors. The location of Dun House is on the A935 road from Montrose to Brechin after the Bridge of Dun. Access the holiday flats by driving up to Dun House and turn right when you see the tearooms. Go through the circular arch entrance through to the courtyard and park to your immediate left or right. The two opposite staircases with metal railings are the flats. The South Flat is on the left hand side as you face the stairs and this is where the www.aboutaberdeen.com team stayed. Access to the House of Dun main entrance is to the back left of the courtyard up the small steps and then immediately facing you. Our review and photos of this Georgian Mansion House can be read on the House of Dun Montrose page. 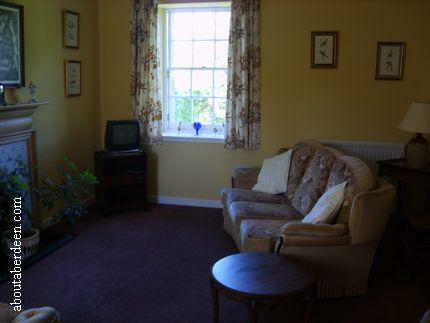 As you can see in the photographs on this page the properties are of historic interest whilst having modern conveniences to make the holiday in Scotland as comfortable as possible. So the kitchens have a microwave, cooker, fridge freezer, washing machine, toaster, etc and the lounge has a TV and DVD player. There is also an iron and ironing board. The kitchen also has lots of plates, bowls, cutlery, mugs, etc. The crockery are the high quality ones for sale in the gift shop and are really nice, a beautiful pastel blue colour. 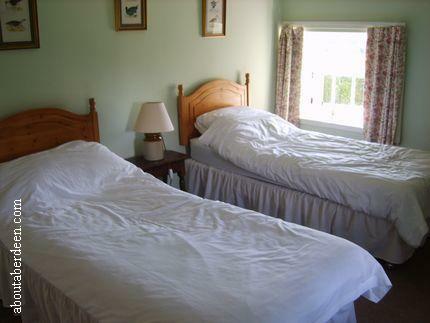 Towels and linen are provided and the beds are made up for your stay in the flat, house or cottage. Please excuse the unmade beds, the photos were taken at the end of our stay and the flat looked immaculate when we took over residence! The flats at the House of Dun sleep four people with twin beds in each room. The lounge is large enough to accommodate guests sleeping on the floor by arrangement though am not sure if this is permitted..
Complimentary milk, tea, coffee and sugar are provided for your arrival. 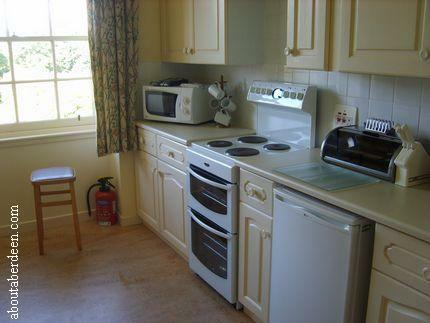 Some National Trust for Scotland holiday accommodation properties are suitable for disabled people. In the case of the House of Dun Scotland holiday flats there are about 20 steps to enter the flat and five steps once inside leading to the bathroom, toilet and second twin bedroom. These can be seen on the picture below. There is parking space for about 4 to 6 cars immediately outside these Scottish holiday flats with a larger car park a few minutes walk away. Immediate buildings by the House of Dun flats include the tea room, gift shop and display rooms. So once the House of Dun closes for visitors it gets silent and makes this holiday in Scotland ideal for those looking to get away from it all. There are two flats, each on opposite sides of the courtyard, called the North and South flats, and did not even see or hear the neighbours. So with plenty of wine in the fridge and some ready meals and snacks we had some peaceful evenings whilst exploring the nearby attractions during the day. Non NTS members get free admission to the House of Dun and other attractions we visited included Edzell Castle and Peter Pan House J M Barrie Birthplace Kirriemuir. There is a dining table and chairs as well as two armchairs and a sofa in the lounge. 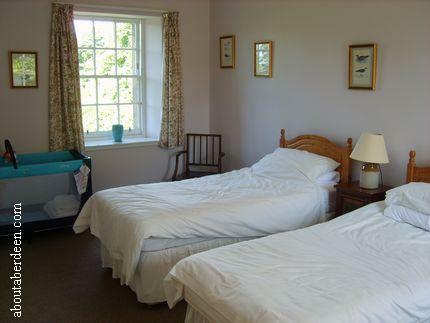 A cot can be found in the main bed room and all beds have bedside cabinets and lamps. One hint for the living room is to find the light switch for the old fashioned lamps. It took us ages to work out that though they are plugged into an old fashioned two pin wall socket and have their own switch they are operated by a wall switch above the dining table. Reading the visitors book tells that others have made this error and stayed in a darkened room throughout their stay! A torch and spare batteries can be found on the hall table for when you go outside in the dark and there is an outside light. Electricity, gas or oil for heating, cooking, lighting, etc is free so no need to pack lots of 50p or �1 coins like in some holiday flat accommodation in Scotland. The lounge has an open fire and aboutaberdeen.com think that coal or wood would be provided for winter breaks for those who want to have a romantic and warming open fire though there is a good heating and hot water system with timer. The kitchen has many utensils like a tin opener, tattie masher, grater, wooden spoons, sharp knives and the all important corkscrew and even enough items to do some basic baking. The National Trust for Scotland Holiday Accommodation brochure has a list of items found in most of their accommodation and if you are staying for a 3 day winter break the NTS can deliver a luxury food hamper of traditional Scottish foods. In 2008 this cost �300. The bathroom is spacious and has a bath and shower, shaver point and light, radiator and huge fluffy bath towels and hand towels. The beds are made with fresh sheets and duvets and large blankets can be found in the big cupboards. Weddings can take place at the House of Dun and the sound of the music can carry to the flats but once the windows are closed it blocks the noise. It is nice though to see the beautiful bride and some of the guests dressed in their kilts. When we stayed the bride arrived in a bonnie horse and carriage to the House of Dun for her marriage and reception. The easiest way to book a Holiday Flat Scotland stay at the House of Dun flats is to phone the NTS on 0844 4932100. Credit card payments can then be made by telephone and arrangements made for collecting the key to the property. There is also a booking form in the current year's holiday accommodation book. In the case of the House of Dun the key will either be at the Hall reception of the Mansion House or the flat will be unlocked with the key on the hall table. Behind the door are contact numbers for staff such as the Property Manager. Entry is after 2pm and you must leave by 10am so that the cleaner can prepare the flats for the next guests. 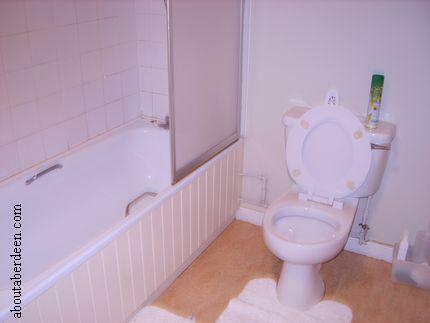 www.aboutaberdeen.com would like to thank the cleaner for such a spotless flat. Bookings can be made from Friday to Monday, Monday to Friday and Saturday to Saturday. Christmas and New Year breaks can be made by arrangement and the House of Dun flats would make for an intimate setting. Confirmation and advice sheets will then be sent to you by post or e-mail. This includes safety advice like not smoking or lighting candles during your stay and not to allow your dog on furniture or beds. A map was sent to us along with easy to follow directions. 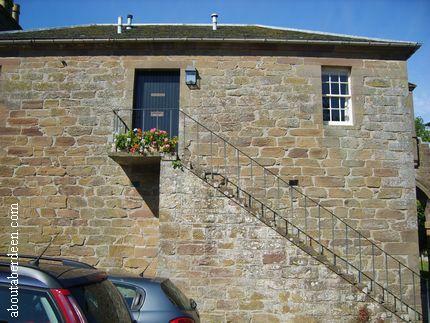 The House of Dun flats were formerly an 18th century Stable Block made of golden sandstone. 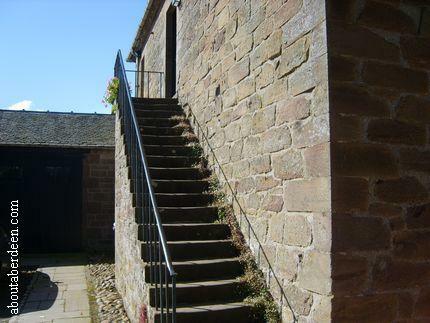 The original use was to provide accommodation for the coachmen, grooms, stable hands or visiting servants. Though none of the NTS staff could confirm if there was a ghost at the House of Dun the older visitor book to the flats makes for interesting reading. Several people have written about seeing a white lady ghost in the bedroom of the flats of the House of Dun. Though aboutaberdeen did read that they were started by children, though a later entry was written by an adult. Our kids didn't report anything unusual and my wife and I had good night sleeps. If you have seen the ghost of the House of Dun and want to tell us about your sighting then please contact us. Please also use the same e-mail address to add any comments on this review or send photos of your stay for use on this page. The visitor book also has restaurants and places to visit recommendations. Read the aboutaberdeen review and view our photographs of the Mansion House on the House of Dun Montrose page.